During World War II, a battleship was the largest type of ship you could find in the US Navy, and it had bigger guns than any other type of ship. 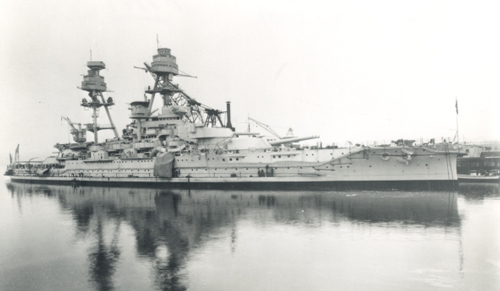 When the USS Oklahoma was built in 1916, it was the largest and most advanced ship in the US Navy. The USS Oklahoma needed 2,166 sailors and marines to function properly, and could travel 20,000 miles without refueling. It weighed 11,000 tons and carried ten 14-inch guns. The guns on battleships are rated by the diameter of the ammunition used. A 14-inch gun has shells that are 14 inches in diameter and weigh about 1,400 pounds each. That means that each shell fired by one of these guns weighed about the same as three motorcycles. Each of the Oklahoma's guns could fire almost twelve miles. That is farther than anyone could see, even with binoculars or a telescope, so the Oklahoma had two airplanes it would use to find targets. They are called spotter planes. 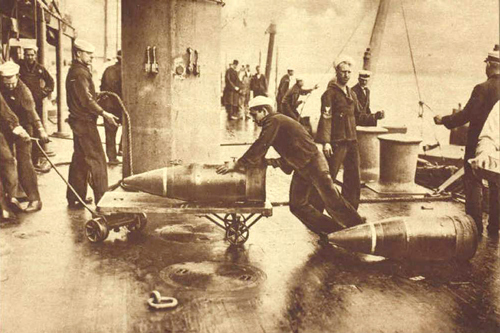 Sailors moving a 14-inch shell around the deck, by hand (image courtesy of the Library of Congress). 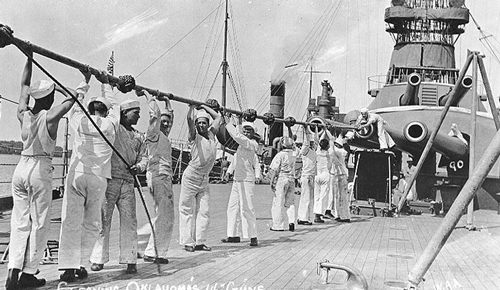 Sailors on the USS Oklahoma cleaning one of the 14-inch guns. The gun barrel for a 14-inch gun is over 53 feet long, which is longer than three average-sized cars (image NH 44422, courtesy of Naval Heritage & History Command). 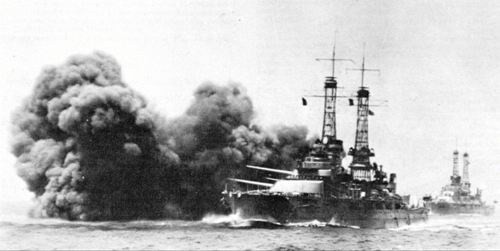 The USS Oklahoma demonstrating its firepower during gunnery practice. Each shell fired by her 14-inch guns required 420 pounds of gunpowder (image 80-G-1023157, courtesy of Naval Heritage & History Command). The USS Oklahoma at the Puget Sound Naval Yard in Washington, September 28, 1940 (1256-40-1701, USS Oklahoma Memorial Association Collection, OHS).